I do my nails a lot. Partly because I like to change things but mostly because most polish only lasts 3-4 days on my nails. It can be annoying, but with so many brands offering at home gel polishes that claim to last up to two weeks it seems there could finally be a solution. 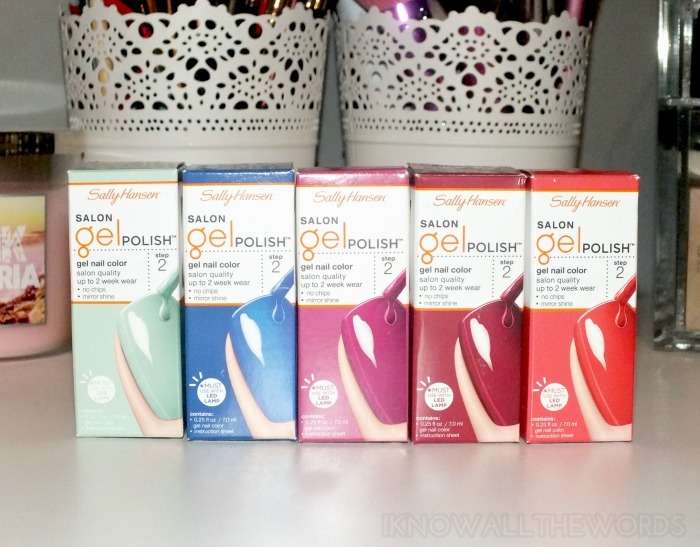 For the past few weeks I've been testing Sally Hansen Gel Polish to see if it really could last two weeks. My results? Read on! 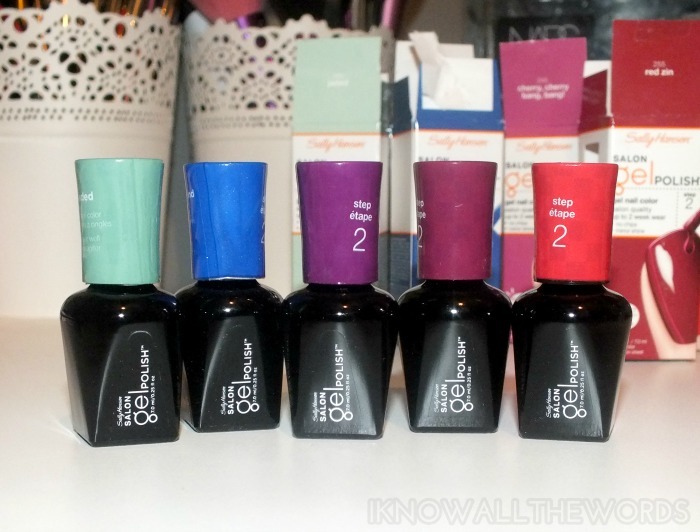 Sally Hansen Gel Polish is interesting in the fact that the shade range- currently there are 32- is made up of shades from their Complete Salon Manicure range. I love that it gives you the option of getting a favourite shade in gel form. The gel polish works the same way most others do in that it requires a base coat, top coat and an LED lamp to cure your manicure. Application is easy as it's as simple as a coat of base, then cure, a few coats of colour, curing between each, and finish it off with top coat, one last cure and a wipe down with alcohol to remove the sticky layer. Actually, it kind of sounds like a lot, but it's not and in the end you're left with a perfectly shiny manicure and it's already dry. I think that is actually my favourite thing about gel polish. When I have enough time to do my nails, but not enough to wait for them to dry, I reach for the gels. You really can't beat the instant dry! I already had the Kiss Pro LED Lamp, so I used it, but Sally Hansen does have their own lamp. I did opt to pick up Sally Hansen Gel Polish Base and Top Coats for testing purposes as I really don't know different brands work together or not. The Sally Hansen base and top coats are sold individually but are also available as a refill kit which includes the base coat, top coat and cleansing pads, which ends up being more economical than purchasing individual bottles. The most recent shade I wore, was Jaded a light turqoise-jade green shade. The shade is very pretty but suffers from the same weak formula as it's CSM counterpart. The formula is quite sheer and thin in both formulations and required multiple coats. I ended up using three coats of the gel polish to get to full opacity and they were thicker than they probably should have been. The multiple coats may have effected wear time, as I found I did experience some lifting by the fourth day of wear and ended up removing the polish by day seven. When I took it off, the polish hadn't chipped, which was great, and still looked pretty great, but the lifting was getting to me. The first shade that I tested, was Red Zin, a deep blood red shade. This shade only required two coats for perfect opacity and wore really well. I got a full nine days of wear, which for my nails is AMAZING. By the time I removed this shade, I did have a some small chips but only minor lifting. Overall, I am quite impressed with this polish! I didn't expect to get the full 14 days of wear on my nails, so I can't hold that against them. I love that this range has so many colours available and that I can pick them up easily at the drugstore. Tried them? Thoughts?